I first met Audra Mulkern through a mobile photography community in Seattle. We hit it off with our mutual passion for photography and then found that our love for music was very similar. I love Audra's photographic work and then found many of her projects to be very intriguing. One of the more notable projects being, "Rooted in the Valley." This photography project documented the seasons of two farmers markets in Washington State's Snoqualmie Valley. Her newest project is the Female Farmer Project. It is an ongoing documentation through photography and story of the rise of women in farming. It is a beautiful and powerful collection of stories of women who create change in our food systems. Let's hear more about the project from Audra and the women she has met along the way. Hello Audra. Please share with us the mission and vision of the Female Farmer Project. The mission of the Female Farmer Project is to document the rise of women in agriculture. I share the images and the stories of women who farm. Some of these women are first generation farmers who come from the corporate world; lawyers, anthropologists, executives, scientists who are bringing a unique skill set to the farm. Some are third or fourth generation farmers but bring a new vision and fresh ideas and are responding to the needs of today's economy by diversifying the farm income. My vision for the project is very simple, I hope to provide inspiration to the next generation of farmers, shine a light on the incredible work that these women are doing, and to help build community amongst them. What are the responses you have gotten from the women that you have documented thus far? I'm always touched by the response I receive from other farmers - they tell me about how the pictures and stories gives them a sense of validation and in a way authenticates their own story and journey. I've had many men tell me that they appreciate these stories, because they are the sons, grandsons, and husbands of women farmers and appreciate the stories and legacies being honored. Can you share with us a couple short stories of a couple women you have documented? Rand Rasheed of One Leaf has only been farming for four years; she is currently leasing the 5 acres where she grows a variety of vegetables to sell at local farmers markets. Like many other young and new farmers, land ownership is a financial barrier of entry that could potentially have Rand hanging up her tractor keys and changing careers. 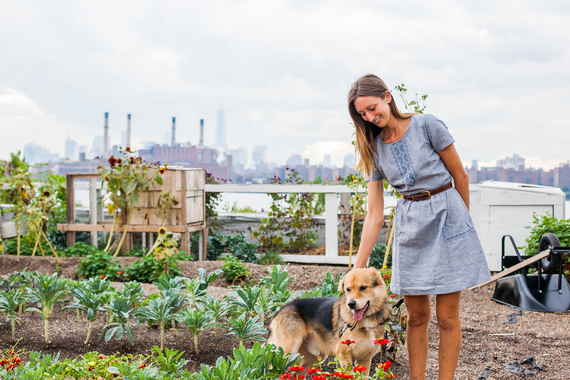 A passionate advocate for urban farming and gardening, Annie Novak is the co-founder and farmer at the Eagle Street Rooftop Farm in Brooklyn, New York; the Manager of the Edible Academy at the New York Botanical Garden, and the founder of Growing Chefs, a non-profit dedicated to food education from field to fork. 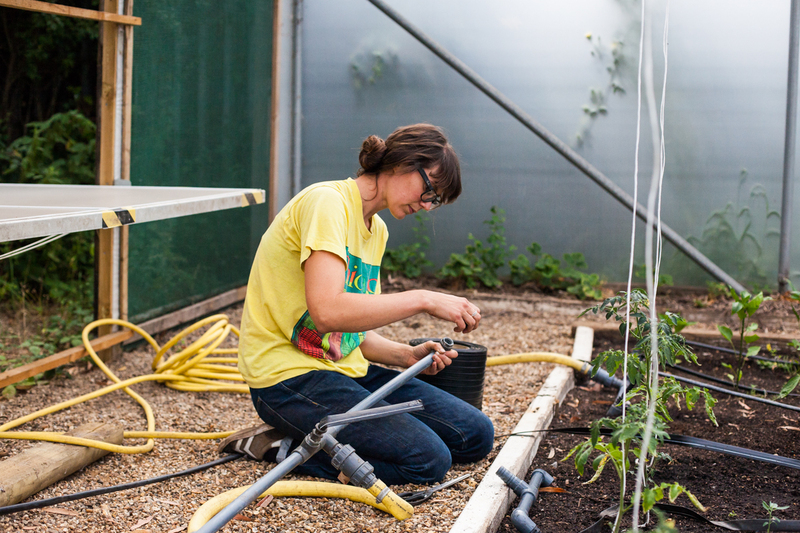 Growing food in a sustainable way in urban London was Alice Holden's challenge. 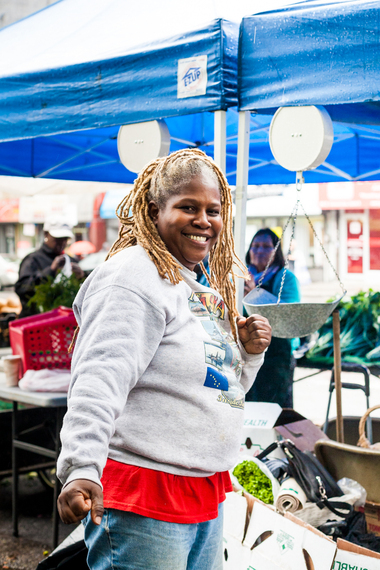 In her two years with the Growing Communities Dagenham Starter farm she has built a certified organic, self-financing farm through produce sales. As part of the process of reclaiming this former council plant nursery she is building a water reclaiming system for farm irrigation and cutting water costs even more. Through her processes and methods, she has created a sustainable urban farming model that can be duplicated throughout London and beyond. When Alia Ornstein's job as a labor and employment attorney was no longer personally fulfilling, she decided to make a drastic change. She left her law career with the intention of pursuing a new career path in education, but wanted to also incorporate her love of growing food into her new life. When researching her next steps, Alia entered "urban farm" into her online search and happened upon an opportunity at Brooklyn Grange rooftop farm, where she is now a farm manager and director of sales. Through the Grange's farmer training programs and her work with the Grange's educational non-profit partner City Growers, she is now able to introduce people of all ages to agriculture in an urban environment, make a difference in the lives of young people and grow really great food. 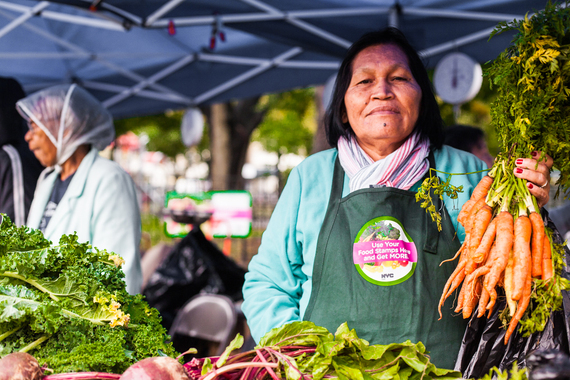 If you want to see what Food Justice looks like, its this; a rainy day in the Bronx where Karen Washington and the coalition of La Familia Verde farmers are having their weekly farmers market. These women, some of who are in their eighties, are growing fresh food in urban gardens through out the neighborhood and are bringing it to the people in their community. Karen Washington and La Familia Verde work to remove the stigma and idea that your income precludes you from access to fresh produce. 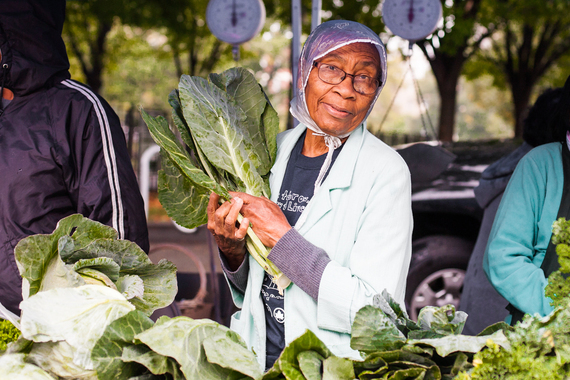 For the farmers that come to this market, they know they're not going to make a ton of money selling produce here - they're here to make sure that everyone has equal access to their food thus helping build friendship and community. Please share the historical background of women in farming. What is it's evolution and what will it look like in the future? Women have always played a major role on farms. Their contributions to the success of the family farm are enormous, and are often overlooked. 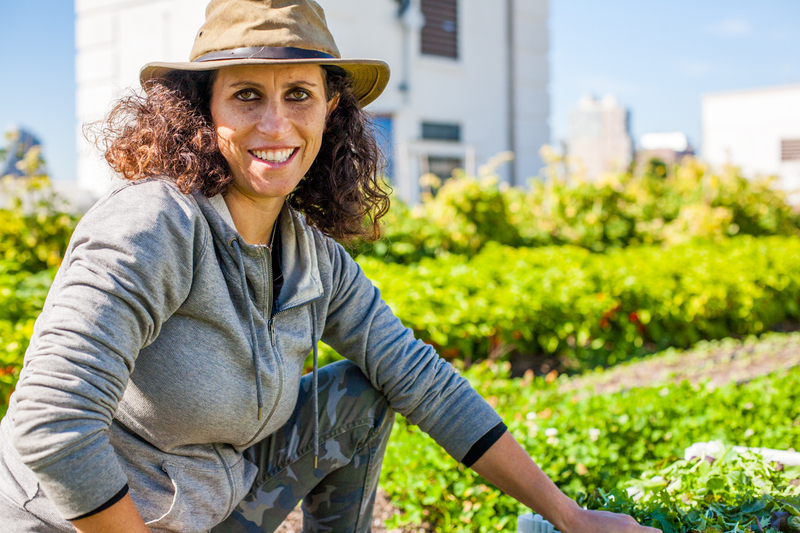 Women have played supporting roles on the farm but over time women began to assume greater roles, become landowners and now there is a rising tide of women-owned and operated farms. As I have visited farms around the world I have noticed that female apprentices outnumber the males. I truly believe the wave of women in agriculture is just beginning. This year is United Nation's "The International Year of Family Farming". Family Farms and smallholder farming play a significant role in food production for our planet and women are the majority of those smallholder farmers. Training, technology and resources are being generated to help support them like no other time in history. What are the demographics of female farmers? 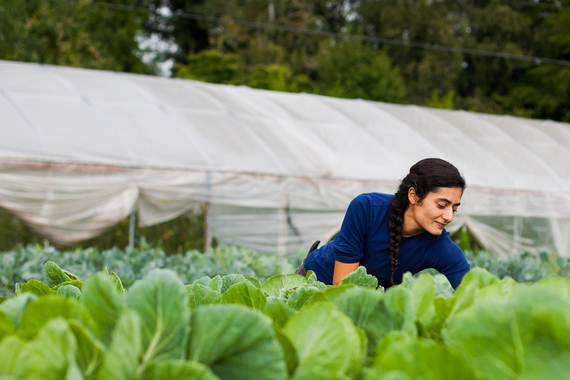 The average age of the female farmer in the United States is over 58 years old and rising -- it's critical to support and train the next generation of farmers now. (USDA 2012 Agriculture Census) Another trend that excites me is that over the last few years there has also been a significant rise in Minority Women owned farms with Hispanic women leading the way with an increase of over 21% between 2007 and 2012. Share with us how you chose this project? My first foray into the world of the photographic essay was my self-published book of mobile photography, Rooted In The Valley: The Art and Color of the Snoqualmie Valley Farmers Markets. Over the course of photographing an entire season with these farmers I began to notice that there was a deeper story that needed to be told. I noticed that many of the farmers and farming interns of my farming community were increasingly women and they were quietly addressing issues of poverty, hunger and accessibility to fresh produce. I wanted to shine a spotlight on the work that these women were doing with no real recognition in the media. Tell us about your love for food, farming, and photographs. I live in a rural community, my neighbors are farmers, I have been part of a CSA (community supported agriculture) for almost 16 years -- I felt like people, even some in my own community, were disconnected with what it really takes to grow food and bring it to market. I wanted people to get an unvarnished peek into life on the farm. I like to take photos primarily with my mobile phone, but sometime last year I picked up a camera for the very first time and have tried to learn to use it to capture what I see on the farm -- the beauty and bounty in contrast with the hard work. What I love most about photography is the ability to capture a moment in time; I love to find the seedlings of stories. I have an older, used camera and one lens --those along with my mobile phone are my storytelling tools. What's next for you? What's next for the Female Farmer Project? If possible, how can (or what's the best way) others can help out with this project? The old adage "think globally, act locally" is a philosophy that I live by. I am continuing to support and be a spokesperson on behalf of my local farms and farm advocacy groups in any way I can. I am also considering writing a book on the first year of the Female Farmer Project. As for The Female Farmer Project, it is just getting started! It's important for me to share the stories across generations and cultures. There is a whole middle of America and the rest of the world to capture and I'd like to keep at it so that the project represents stories from all walks of life, and all kinds of farming. I think the most valuable way for people to help their local farmers is to introduce themselves to their local farmers. Shake their hand, and ask them how you can help support them. And if you happen to be a female farmer, I'd love to hear from you! This is a very important time in history and it's such a pleasure and a privilege to be a part of it.